Last week I learned about a rather bizarre invention: powdered alcohol. Apparently it’s not the first time booze has been made into a fine dust, but “Palcohol” got major press when Lipsmark LLC launched a high-gear marketing campaign coinciding with the federal approval of the stuff, which then generated widespread concern and the eventual reversal of the Alcohol and Tobacco Tax and Trade Bureau approval. 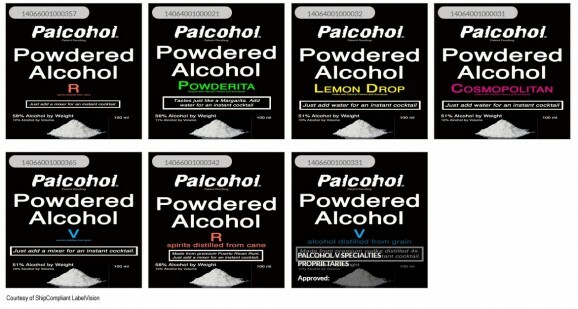 Apparently, you take a packet of Palcohol and just add water, or whatever you want. You can mix it with pretty much anything, including food. Can’t we stop at Jell-O shots? What a terrible idea. But the science behind Palcohol, now that’s interesting. Alcohol’s a liquid, right? At least, at normal temperatures it is. It cooks off when you add it to pasta sauce, and that’s also is the reason flasks were invented. So what’s up with Palcohol? The process essentially turns alcohol into a solid, then into a powder. Cyclodextrins are starch-based compounds that, with the help of enzymes, turn into a ring of sugar molecules. They’ve been used for a long time in foods, pharmaceuticals, chemicals, agriculture, and engineering. Other molecules can be inserted into the middle, since they’re often inactive ingredients used to house the active ones. They absorb other molecules, such as ethyl alcohol. When liquid ethanol is stored within a cyclodextrin, which is a solid, it becomes powder. This storage system is pretty efficient, too, cyclodextrins can store over 50% of their own weight in booze. They’re like the ants of the chemical world. When the powder is mixed with water, it dissolves and the ethanol is released. This is fascinating, but still a bad, bad idea. This neat absorptive trick is the same one NASA uses to make Maximum Absorbency Garments—ie, space diapers. You know, the kind Sandra Bullock wasn’t wearing in Gravity. These high-tech diapers can absorb a lot of water without becoming liquid themselves. Instead of using cyclodextrins to hold the liquid in place, space diapers use sodium acrylate polymers, but the concept of super absorption is the same. The two kids above explain it better than I can, and they’re far more charming.